…she turns to instant netflix as background music, because as long as she is stuck at a single 4 ft X 4 ft dining table might as well get through as many seasons of Prison Break as possible right?! Sometimes I think that Instant Netflix was the best thing ever created, and other times I curse it for affording me access to titles that I refuse to admit I watch. That’s right SciFi (or SyFy whatever you are calling yourselves these days) I’m talking to you. I now have a relatively comprehensive knowledge base of some of the best/worst space themed shows that have been produced in the last 10 years. Are they good, not really, except for the few exceptions ( I do really like Firefly, and BSG wasn’t half bad either). It’s just that I’ve actually made my way through pretty much all of the acceptable television shows, Weeds, Dexter, Mad Men, you name it I’ve seen it, I even hit up every one of the 20 Great TV shows in Instant Netflix on Paste (to be fair I think I had already seen half of them to begin with). I even did a little throwback and watched some of my old WB favs, which is hindsight may have been the catalyst for what has become a very quick spiral downhill into the world of battlestars and stargates, and who really knows what else (damn you Instant Netflix suggestions, just because I watched all 3 seasons of Roswell in 3 weeks does not mean I am a SyFy nut) It’s like a trainwreck that I just can’t look away from, I just keep clicking that little forward arrow button and moving onto the next episode. Enter Prison Break, my savior. I had completely forgotten about this one until I was over at a cohorts beginning my week of studying, she was watching it, Thank God. 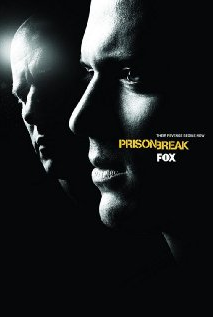 Without this show I would be coming dangerously close to heading out to Comic Con next year to join “my people.” Thank you Prison Break and your corrupt CO’s, shifty Cons, and amazingly gorgeous, and geniously innovative Inmates, yes Michael Scofield I’m talking about you. So the moral of this story, I think I’ve slowly lost my mind from studying for comprehensive exams. Did I also mention I have a giant territorial carpenter bee that basically dive bombs me every time I try to get out on my deck, so until someone comes to spray something that makes giant carpenter bees go away I am stuck with opening my windows to enjoy this beautiful weather we are having. * what are you favorite Instant Netflix guilty pleasures? You know what I’ve started doing? I added the Netflix App to my iPod touch and now I watch episodes of Code Monkeys before I go to bed while in bed. Tucked in, not sitting up- I know you prefer sitting up.